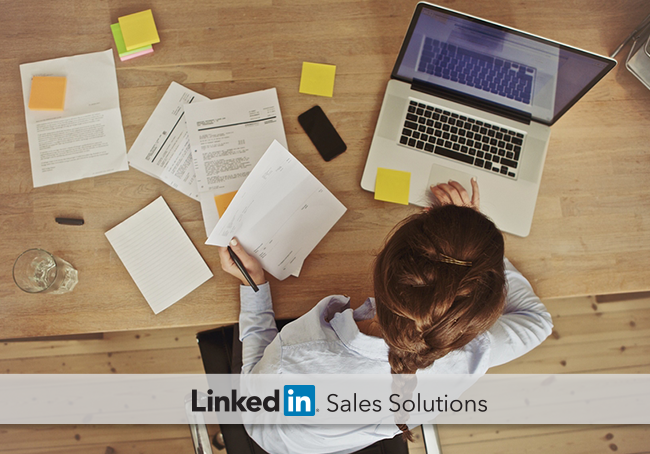 Here's 5 skills you'll need to sell using LinkedIn's social selling tools. To sell effectively in the social era, you need to make sure your skills are adapted to the fast-paced, relationship-driven brand of modern sales. LinkedIn is uniquely capable of ushering sellers into the new age. Here are 5 essential skills to sell in the social era and how LinkedIn provides the solutions to implement them. There’s a sea of information out there. How can sales people dive in and find the right prospects? You may be surprised to hear that 90% of the data in the entire world has been created in the past two years. With so much information, it becomes essential to search for the right cues that lead to better prospects. True listening means that you dedicate time each day to identify what your prospects are talking about, and then adjust the messaging to align with that direction. For example, if a certain event or news source captures prospect attention, you’ll need to leverage it in your daily selling strategies. Skill: Create alerts that inform you when a potential prospect contributes to discussions online, as well as for tracking overall industry insights. The new Sales Navigator provides alerts and sales updates that tie directly to prospect events, including role changes, work anniversaries and new connections within your network. These alerts can be delivered via email and through the new Sales Navigator interface. Social listening is the first step toward building a lasting relationship, but it should also serve to maintain connections throughout the pipeline. Content sharing and social engagement round out the relationship-building process, as sales rep and prospect begin to understand what the other can deliver. Skill: Study prospect behavior and language, and demonstrate that you understand the business problems they face – it’s the first step to building a lasting business relationship. Best-in-class sellers utilize LinkedIn for a variety of relationship-building techniques, though they make specific mention of the hidden connections that surface within their networks. Third-degree connections generated from existing relationships are far more effective than cold calls, and LinkedIn’s new Sales Navigator’s Extended Network Access allows users to dig deeper for undiscovered warm leads. In the social era, the best sellers should know more about their prospects than they know themselves. You can weave through endless streams of data to find new connections, or you can try using Unlocks in the new Sales Navigator to gain instant access to prospects beyond your third-degree connections. Monthly locks are included in a Sales Navigator Team seat. Personal branding is essential in social selling – you want to distinguish yourself from countless other sellers online. Building a personal brand requires investment in growing your network. Skill: Build your personal brand by connecting with existing customers, reaching out to new contacts, creating a professional presence online, and delivering content that answers prospect concerns. A complete LinkedIn profile provides instant credibility with the prospect audience, but you can take an additional step with new Premium Profiles. Look your best with a 30% larger profile picture, as well as a customized background image. Use both of these images to your advantage, creating a connection that draws in your audience. Social selling offers unique opportunities to sell for solutions, directly related to the buyer’s journey. Thankfully, searching for customer pain points is far less taxing in the social era. Skill: Use your social listening campaigns to identify what issues prospects are surfacing – and adjust your sales strategy to solve those specific problems. Have you identified a specific issue that plagues your prospect audience? What if you only want to see how long-term decision makers are discussing the issue? With the Premium Search options in the new Sales Navigator, reps can narrow their search focus by specific job titles, groups, company sizes, and more. Try plugging in a common issue keyword into a Premium Search and see where the issue lies among the prospect audience.